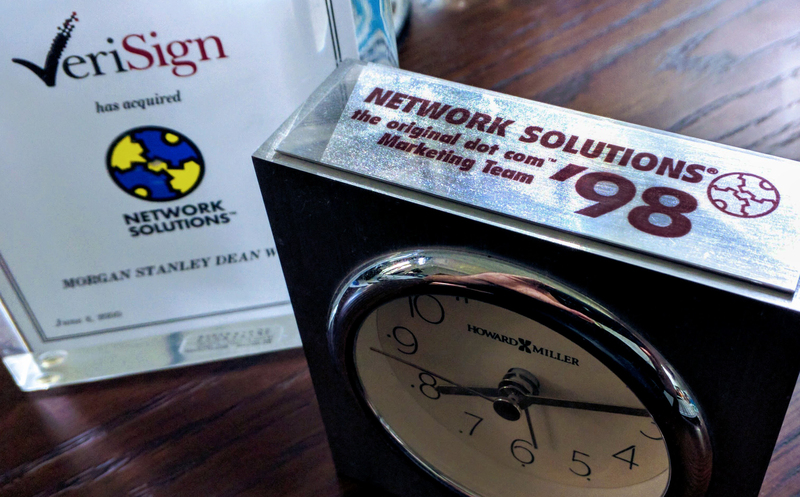 There were only 1.8 million registered .com names when I joined the NSI (Network Solutions) Marketing Team in the summer of 1998. ICANN was formed just a few months later. By the time we were acquired by Verisign in June of 2000 there were roughly 14 million names in the .com database. I recall predictions that one day there would be 100 million registered .com names. Some thought that was a craaaazy number and wanted to know what we were smoking. To me achieving that number seemed possible, but that it might take a decade or more. The market then paused for a few years. Looking back it was incredible buying opportunity for those that understood the long term value of good generic keywords in the form of .com names. Today Verisign manages roughly 128 million registered .com names. Relative to today’s lean operations at many domain registries and registrars, it’s hard to believe that back in 1998-2000, with a monopoly position and .com practically selling itself, NSI employed 50+ people on the marketing team pumping out the .com message day and night. Messaging that included how .com could be used with this incredible “killer app” called “email” where you could have an address such as mary@flowers.com instead of marysflowers582@aol.com. Now it seems that some TLDs are at a growth pause or experiencing negative growth, particularly in the cases of some new gTLDs that were heavily promoted in China, or where promo deals were done with greater China area registrars. I don’t need to call them out. You know who they are. Today’s market and regulatory conditions surrounding the creation and trading of domain names is quite different from market conditions that existed in the past. The China bubble has burst and the free-to-nearly-free domain create promos don’t seem to have worked. Some registry and registrar operators seem to have never adjusted to the new realities, or figured out how to leverage all the incredible data, tools, and experienced human intelligence available to them today vs. relatively little that was available to us 15-20 years ago, not to mention common business sense. Some registry operators have latched on to a PR huckster type of introduction to the Chinese market that might please inexperienced applicants and domain name investors at first, but does little to demonstrate value compared to .com or the local ccTLD (such as .cn) and how to achieve scaled up real business and end-user utilization of a particular TLD via the registrar channel. I’m not immune to this and have learned tough lessons via my personal and business experiences in China over the years. Sometimes the best way to gain traction in a foreign market is to say as little as possible publicly and really learn how the market and culture operate before you press on with operations, marketing and sales. Especially for China. China is HARD. You will not be successful there, as a foreign registry operator, at a minimum, unless you understand that you will likely lose money or barely break even for several years and are prepared to deal with that reality. You must be in it for the long term. Long term, at a minimum, is 5 years of sweating it out (flying back and forth on a near monthly basis) before things *might* work out. Over the short to medium term the domain industry is likely to shed inefficient registry and registrar operators and investors, especially some of those who banked on new domain extensions (new gTLDs) that have no real consumer traction—which are many— and can no longer, or are just unwilling, to fund the basic holding/operating costs, let alone fund any marketing team or person. For sure there is an easily foreseen correction—if not outright registration numbers recession—going on right now for some in the domain industry. Perhaps a short growth pause for .com and some ccTLDs, but their long term outlook to me is strong (same for some generic IDNs) as they do not need explaining to their primary target markets. In case you didn’t read the latest Verisign Domain Name Industry Brief, the 294 ccTLDs make up about a 43% share of total global domain registrations, with the top 10 ccTLDs composing nearly 65% of the overall ccTLD count. This has been rather consistent over the last 8 years, nudging from about 40% of the total market in 2009 to today’s 43%. By comparison, the roughly 1,224 new gTLDs have only managed to capture about 7.7% of the overall global domain registration total, with the top 10 new gTLDs composing 64% of the total count—and that top 10 list is likely to shift around a bit in the coming months. Last, I’m thinking some domain types that had dollar signs in their eyes just a few short years ago may be now wishing they invested the same funds into bitcoin! Speaking of bitcoin, its status in 2017 reminds me of .com in 1998. It’s a relatively new digital asset that sells itself and appears to be enjoying rapid traction in a relatively unregulated “wild west” type of market. The “killer app” seems to be the blockchain and big time household names are paying attention. It doesn’t need much of a marketing team and the general public still doesn’t quite understand its future significance. Registries need to focus since you can’t promote so many new domain extensions. The way .CLUB did it was right. Grab one good extension and market the hell out of it.